Ok, 90% may look a lot and you thought that 'it's too good to be true'. While you can't be blamed for thinking it's a total bull*, there is truth to it. A 100W incandescent lamp can be replaced by a 20W compact fluorescent lamp (CFL) of an equal luminosity. Today's technology can offer a LED lamp equivalent of 10W to 12W power consumption. So, comparing to incandescent lamps, switching to LED saves you about 88% to 90%. However, most of us are no longer using 'traditional' incandescence lamps nowadays, hence, that 90% efficiency claim is not attractive to us anymore. The reference now for efficiency gain is the CFL, which is a big improvement from the energy guzzling filament lamps. Still, LED is the way forward. In 2012 the Ministry of Green Technology and Water announced that to government is phasing out traditional light bulbs (incandescent bulbs), which would eventually lead to a complete ban in 2014. I don't know if everyone has thrown theirs in favour of LED lamps yet but for me the announcement was a 'hasty' one. 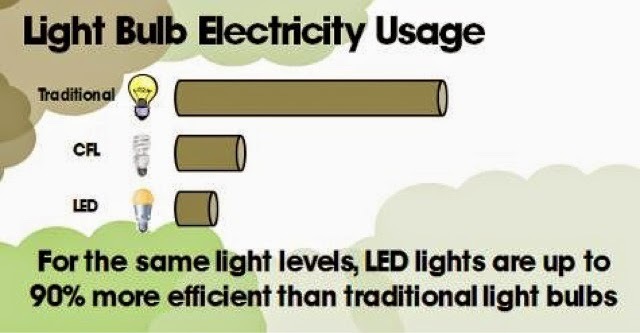 Should we change to LED light bulbs now? Ideally yes. But there is issue with this type of lighting, apart from the PF issue (though it may not be anymore), the manufacturing of LED lamps is highly unregulated unlike the conventional ones. The LED component itself may last 10 years, perhaps 15 or 20 years, but the driver unit's lifespan varies and is significantly shorter. Due to the unregulated (not standard) construction of drivers, one that's fabricated by Osram for instance, would not fit one that's fabricated by Phillips. What this means is that, you end up buying the whole set of lamp instead of just replacing the faulty parts - which is an expensive exercise. You will then be stuck with one brand, without having the flexibility of switching between Philips, GE, Panasonocs, Osram, etc. Moreover, LED lamps are still very expensive and you don't want to replace them after just 2 to 3 years due to faulty drivers. Doesn't this remind you of the convenience - you currently enjoy - of replacing your 36W fluorescent tube with a brand of your choice? The Green Mechanics: Prices of LED lamps are dropping but not appealing enough for me. I'm currently more inclined towards replacing mine with the CFLs. I use them a lot - 20W, 23W and 25W - equivalent to traditional bulbs of 100W, 125W and 150W respectively. This is really an informative article and this describe why we change our light with LED lights. Previously we have used CFL for power saving mode, but now instead of CFL we can use Motorhome Led Lights and I am sure it will be a better alternative due to its less power consumption and long life period.